Our patrol team is actively engaged in forest protection and reforestation in the Western Area Peninsula National Park (WAPNP) and community forests of Moyamba and Pujehun District. Tacugama is located in the WAPNP in the vicinity of one of the main water catchments of Freetown, Congo Dam, which faces increasing pressure from illegal human encroachment. Since 2015, we have employed 3 Community Patrol Guards as observers and wildlife and human data collectors. In 2017, 4 NPAA (National Protected Area Authority) forest guards have joined the team to support Tacugama and fulfil the government mandate to take action. This 7-man team constantly patrols the Tacugama area and has access to a rapid response team of 12 NPAA guards, who are stationed nearby and are assigned to cover a larger area along this axis of the WAPNP. 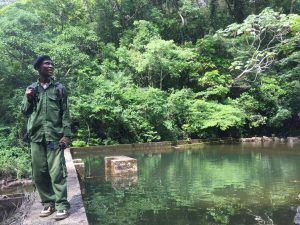 Additionally, in the rural areas Tacugama has 10 bio-monitoring technicians patrolling community forest and engaged in the reforestation of its wildlife corridors. 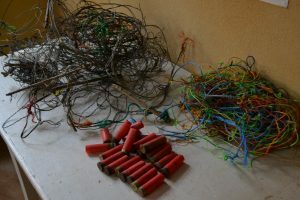 Since 2012, 3 illegal charcoal pits have been dismantled, and 146 snares and 19 shotgun cartridge shells have been recovered in our current range of patrol. Without the presence of our patrol team, the habitat may not be as well preserved as it is today! 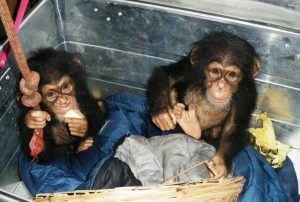 Despite our best efforts, the problem of displaced chimpanzees is an ongoing battle. 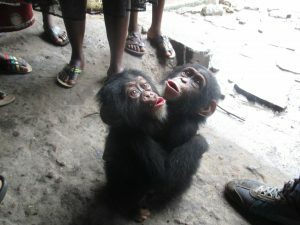 Orphans, often captured for sale as pets, or victims of the bushmeat trade or other human-wildlife conflict, are often kept in human homes or villages until someone familiar with the law alerts the authorities. Our patrol team, along with the NPAA guards has the authority of the government to confiscate and charge offenders who are trading in endangered species. When alerted of a chimpanzee being held, members of our animal care team, outreach team and patrol guards will often visit the site together to peacefully confiscate the animal. Information about the animal’s history and medical condition is collected, and the community members and offenders are then sensitized as to the issues surrounding the wildlife trade.